In just a few weeks we’ll be gathering in Amsterdam for Summit EMEA. This three-day experience is designed to help Dynamics users discover new ideas, learn about Microsoft Dynamics 365 and connect with peers. With a track dedicated to CRM, there’s a wealth of practical information—and inspiration—every day of the event. I will be joined by Siegfried Leiner, Jeff Comstock and Francois Rof to kick off the CRM sessions by talking about Microsoft Dynamics 365, the next generation of CRM. We will talk about what this means to our CRM customers, as well as what’s new as we continue to provide solutions to help you engage your customers and empower your employees. 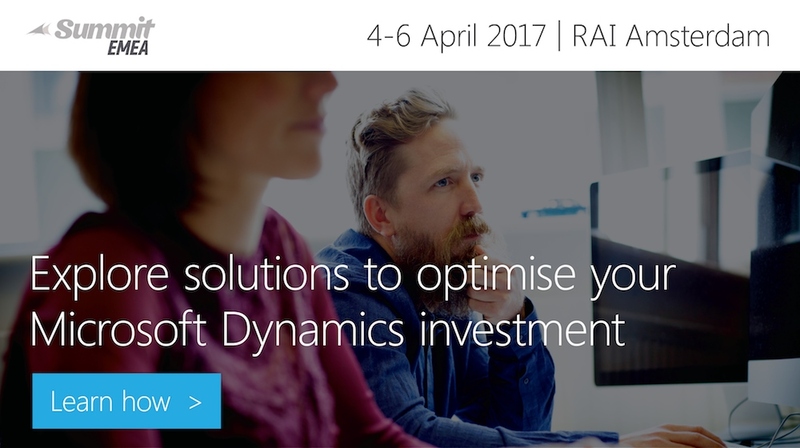 We’ll also share and discuss the future of Dynamics 365 business applications. You can also attend dedicated breakout sessions designed to deepen your product knowledge and gain experience from experts and peers. Each day has a full slate of CRM content, including how-to sessions, roundtables, and deep dives into product capabilities. Increasing sales effectiveness with Dynamics 365. Delivering great customer service with Dynamics 365. Transforming customer engagement with Field Service. Building integrated solutions with PowerApps, and Microsoft Flow. Harnessing the power of social media to achieve real business results. The new Project Service Automation. Taking action with Customer Insights. View the full schedule of CRM content. We also look forward to meeting you in person in the Expo Hall. Mike Ehrenberg, CTO for Microsoft Business Solutions, keynotes the entire event with Microsoft’s strategy for intelligent business applications. You’ll get the inside scoop on Dynamics 365 and how it unifies CRM and ERP capabilities into purpose-built applications to help you meet the changing needs of customers. I hope to see you at Summit EMEA!